Ever wonder why beer never comes in plastic bottles? It’s because it affects the brew’s quality. But a major Japanese beer company has new plans to make a beer-friendly plastic bottle. 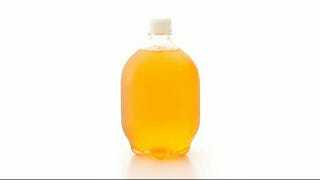 Earlier this week, Mitsubishi Plastics announced it’s teaming with Kirin Co. to make one-liter plastic bottles specifically built for beer. It’ll be coated with a special substance that’ll keep the booze carbonated and palatable. Why’s this a big deal? Because there are scientific reasons that keep brewskis under glass. First, plastic is a lot more porous than glass, which leads to a flat drink way faster. Plus, glass, unlike plastic, isn’t coated with chemicals that could possibly affect the beverage’s flavor. But this planned bottle from Kirin and Mitsubishi Plastics could be the first step in addressing these concerns. The companies want to coat the inside of this new bottle with a thin, carbon coating that’ll make the plastic ten times less porous, preventing oxygen loss that affects taste. Plastic bottles have been housing Japanese wine and sake since 2010, but this week’s announcement is the first time the country’s brewers are using plastic for beer. This could open up commercial potential: Like, sports stadiums and concert venues filled with sloppy drunks would probably opt for plastic beer bottles for safety reasons. Heineken even supplied plastic bottles for London’s Summer Olympics in 2012. This new bottle from Japan, though, will only be used in Kirin’s special deliveries at first, so widespread commercialization is a way’s out. The companies also need to figure out a way to prevent UV rays from deteriorating beer quality, which is another advantage glass (especially colored glass) has over plastic. So yeah, to plastic. Kanpai!